It’s been a revealing two weeks as we took a closer look at the lives of great-great uncle Sherman Foutz and his descendants. We’ve answered a few long-standing questions, and uncovered aspects we didn’t even know to wonder about. Here, a quick recap of the revelations revealed in the latest newsletter series, mainly through new research on newspapers.com, verified and deepened with ancestry.com digging. We revealed the job opportunities that brought Sherman, wife Lizzie, and children Oscar and Grace from Reading to Harrisburg, Pa.
We uncovered the death announcement that preceded Sherman Foutz’s 1915 obituary, our first inkling that Oscar Foutz outlived his father — and spent time in faraway Arizona. A 1969 newspaper feature on daughter Grace (Foutz) Chaney, a year before she died, chronicled her teaching career and revealed new details about how she met husband Fred, and that Oscar may have lived until 1945, 30 years after father Sherman’s death. The circumstances of Grace and Fred’s meeting, as well as her fishy habit of lying about her birth year to the point of it being erroneously carved in her gravestone, led to additional research, and new evidence about why she remained childless: she and Fred may have been related — first cousins once removed. We traced what we could of Lizzie Foutz’s long and apparently lonely life without Sherman, to the point where she vanishes in the 1940 census some five years before her death. She is not found in the homes of her surviving children or grandchildren. We followed Oscar Foutz’s wayward path further than ever before, discovering his athletic pursuits and continued service in the National Guard, noting his divorce from wife Florence in 1917, and her remarriage, new motherhood and possible residence in the Pennsylvania State Lunatic Hospital, as well as her 1938 death and Oscar’s possible surviving past his mother’s death in 1945, when he may have resided in Charlotte, North Carolina. Finally, we learned more about the fates of Oscar and Florence’s sons, Ralph and Sherman, as they made the local papers in Harrisburg, Reading and Hagerstown, Maryland for a series of youthful indiscretions that ran the gamut from petty theft to armed stickups to robbing the homes of their grandparents and aunt — and serving time for it. Getting sent to Glen Mills Schools for troubled youth, outside of Philadelphia in Delaware County, was a constant threat for Sherman Foutz’s rough-and-tumble grandsons Ralph and Harry Sherman as they grew up in 1920s and 1930s Harrisburg. Research in the last month has shed new light on the mysteries surrounding the family and descendants of my great-great uncle Sherman Foutz. As intriguing as new leads in genealogy are, though, they only manage to stitch together the roughest weave of a life. There are still plenty of gaps you can poke fingers through. But that’s the kind of discourse we’re left with as we examine lives of 70, 80… 100 and more years ago. Absent an audience with our actual ancestors, we collect clues, consider them. And end up, perhaps, with a closer understanding of who they were, and what life was like. We can see, for instance, well enough to realize that by the time of his father Sherman’s death, Oscar Foutz was living far away from his family, and divorce in 1917 only seemed to cement that. We can see that Oscar certainly doesn’t show up with family members, or even in and around Harrisburg, from 1920 on. And that widowed mom, Lizzie, though she has the care, for a time, of grandson Ralph and foster daughter Catherine, seems occupied enough with continued existence in Harrisburg, albeit an increasingly solitary one. What happened to grandsons Ralph and (Harry) Sherman Foutz? Newspaper accounts from their boyhood through their 20s reveal repeated run-ins with local and state authorities. They are listed as “homeless,” “old offenders.” They’re responsible for robberies, thefts, the odd assault. We know that life eventually settles down for Ralph. He meets and marries Virginia Henson. Finds steadier work as a truck driver. Has seven kids — and countless more grandkids, through which his story lives on, and new ones among his descendants are written. I’d like to know more about the Virginia and Ralph Foutz who became “gram” and “pap” to my distant Foutz cousins. 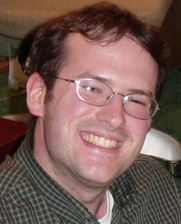 And of his younger brother who shared their grandfather Sherman’s name. Their youth, and what became of Oscar and Florence and Lizzie, is only part of the story. The way my own Grandpa Ley’s losing his mother as an infant, and half-brother as a young teenager, shaped his early life, but he wrote his own story the rest of his 70+ years. Or how my Grandma Erma Johnson Foutz lost three brothers within three years to separate water-related accidents. Tragic at the time. And certainly echoed through stories I heard growing up. But the next 61 years for her were filled with family — six other siblings and countless memories. So, a youth with a rap sheet doesn’t define the shape of the mature man. But it can underline and even explain much of what we’ve discovered about life after Sherman’s death in 1915. I thought it might be useful to view the newspaper accounts I’ve collected in decade-long snapshots. The beginning of the 1920s find 11-year-old Ralph in the care of grandmother Lizzie Foutz and 14-year-old (adopted) aunt Catherine. This is about the time Lizzie works as a cook for the Elks Home. Eight-year-old brother Sherman, on the other hand, is probably living in Harrisburg with mother Florence, stepfather William Frank Orner, and half-brother Raymond Carroll Orner. October 15, 1920: Ralph Foutz, “an old offender”, already on parole (at 11), admitted to running away from home and is sent to Mont Alto hospital for treatment in lieu of being sent to Glen Mills school for troubled youth, according to the Harrisburg Evening News. Jan. 6, 1922: Ralph and Sherman Foutz, “two homeless children,” are sent to Glen Mills troubled juveniles school after “figuring” in a bicycle theft, according to the Harrisburg Telegraph. May 15, 1928: Ralph Foutz, 19, and two other Harrisburg teens stole a car at Bedford and abandoned it at Fort Loudon when they ran out of gas, according to the Harrisburg Telegraph. Aug. 29, 1928: Sherman Foutz, 18, suffers cuts and bruises when he is thrown from a bicycle after colliding with an automobile, according to the Harrisburg Telegraph. As Ralph and Sherman reach their 20s, their involvement in thefts continues, and their estrangement from family seems complete. Youthful, but no longer considered children, their crimes no longer land them in hospitals for treatment or schools for troubled youths. The major crime both are involved in at the beginning of the decade puts them in county prison for more than a year. Their victims? When not random, they include family. Ralph and Sherman break into and rob the farmhouses of their grandpa Francis Hartman and Aunt Hannah Gable, Florence’s father and sister. Ralph faces additional time for stealing a necklace and cash from a girlfriend’s house in Harrisburg. Some context: according to my latest research, Florence’s second marriage didn’t last long. In a genealogy boards discussion from 2006, a daughter of Raymond Carroll Orner reported that William Frank Orner moved away and remarried, and that her father was told as a boy that his mother had died (in reality, she wouldn’t die until 1938, when “Carroll” was 20). By 1930, there is a Florence Orner listed in the Pennsylvania State Lunatic Asylum in Harrisburg. I haven’t cemented the connections yet, but if this holds together, it would seem the fracturing of Oscar and Florence Foutz’s family was complete. Oct. 25, 1930: Ralph, 21, and Sherman, 20, are arrested and charged with robbery after breaking into two farmhouses near Reading, Pa., and stealing men’s clothing and a wristwatch, according to the Reading Times. The homes’ owners? Grandpa Francis Hartman and aunt Hannah (Hartman) Gable. They are sentenced to 1 to 3 years in Berks County prison two weeks later. Dec. 28, 1931: Ralph, 23, is charged with felonious entry and larceny for entering a Harrisburg home and stealing $2.62 and a necklace, according to the Harrisburg Telegraph. July 1932: Sherman, 22, is shot in the right leg by police after he and an unknown companion stole a car from North Third Street in Harrisburg then stole several quarts of milk from the steps of a home on North Cameron, according to the Harrisburg Telegraph. He is sentenced to Huntingdon Reformatory. Nov. 27. 1933: Transported back to Harrisburg after serving 22 months in Berks County prison for breaking into his relatives’ farmhouses, Ralph, now 25, is made to answer for the stolen cash and necklace from 1931. He pleads guilty, but asks for leniency, telling the judge, “I’ve learned my lesson. All I ask is a chance to prove it.” The judge sentences Ralph to a reduced 60 days in Dauphin County prison, but tells Ralph if he is arrested again, he’ll serve three years, according to the Harrisburg Telegraph. January 1936: Sherman, 25, and now living in Hagerstown, Md., is questioned by police after he traveled to Harrisburg for a one-day drinking bout. He is not charged with anything, according to the Daily Mail. April 1936: Sherman, 26, is sentenced to 60 days in Washington County (Maryland) jail for stealing instruments from a parked car in Hagerstown and likely selling them to a second-hand store, according to the Daily Mail. December 1936: A nine-year-old boy reports seeing Sherman, 26, drunkenly steal a car battery from a parked car in Hagerstown. Sherman is sentenced to another 60-day term in Washington County jail, according to the Daily Mail. April 1937: Sherman, 27, and another man are caught by police in the act of stealing a sack of potatoes from a wholesale truck parked in Hagerstown. Sherman is sentenced to 30 days in jail, according to the Daily Mail. August 1937: Sherman, 27, is arrested in Harrisburg and charged with larceny after stealing a .22-caliber rifle and a shirt valued at $5 from a pawn shop, according to the Harrisburg Telegraph. Virginia (Henson) Foutz and Ralph Francis Foutz, in an undated photo. Although I haven’t tried to assemble an exhaustive account of the Foutz brothers’ run-ins with the law, by their late 20s and 30s, life appears to settle down for Ralph and Sherman. Ralph successfully pleads for leniency in the early 1930s, and stays out of trouble before getting involved in a hold-up and robbery. He is granted parole, however, returns to his wife, Virginia, and young son. Feb. 8, 1938: Ralph, 29, is held on $2,000 bail after he and three 18-year-old youths attempt to hold up and rob residents of a Harrisburg house. He pleads guilty to assault with intent to rob, unlawfully carrying firearms and a statutory offense, and is sentenced to 9 to 18 month in Dauphin County prison. Five months later, a judge grants Ralph’s plea for parole, which cites his wife and 2-year-old son being on relief, according to the Telegraph. During the course of the 1940s, Ralph finds steady work as a truck driver, and celebrates the births of Charles Harry, in 1939, and Catherine in 1941. Like his father, Ralph appears to enjoy boxing, as articles in local papers in the late 1930s indicate. A truck accident in 1944 is the final off-kilter news item for Ralph and family in the 1940s. Brother Sherman, meanwhile, faces serious time in 1946 after being involved in stealing from a refrigerator car. Although I’ve found a couple traces of him marrying (a woman named Mary) and moving back and forth between Harrisburg and Hagerstown in the 1930s and 1940s, that’s where the story of Oscar’s younger son goes dark for me. Just as these articles have helped shine a little more light on Sherman Foutz’s descendants in the early part of the 20th century, I’m hoping getting to know Ralph and Oscar through their family will illuminate what happened next. September 1946: Sherman, 36, is sentenced to 2-4 years in the state penitentiary for stealing, along with three other men, 10 cases of evaporated milk from a refrigerator car at the railroad yards in Harrisburg, according to the Telegraph. The street where Sherman Foutz and family closed out their Reading, Pa. days in 1909 bears no trace of their former home. Now, down the street on the right, there’s a parking lot. It’s easy to paint great-great uncle Sherman Foutz’s son, Oscar, as the black sheep. The historical record suggests so, with some mishaps, and maybe a bad marriage, the clear absences. But there are holes. There’s a lot we don’t know. And too much that censuses and official records and newspaper articles fail to reveal. We can’t know, for instance, the personalities behind the official print. The balance of harmony that makes up a household, of love that sparks a relationship, ambition that fuels a career. We can’t clearly discern, 100 years later, the circumstances and darker impulses that move the players on and off the stage. In the case of Oscar Foutz, then, I’ve assembled the most complete chronology I can. With the barest trace of analysis. With some lingering questions. Certainly without judgment. Born Dec. 17, 1888 to parents Sherman and Elizabeth Foutz, Oscar lived out his early boyhood in the old Foutz stomping grounds of Harrison County. Sherman’s appointment, in the mid- to late-1890s, to the U.S. Treasury took the family to Washington D.C., where grandparents Jonathan and Rebecca Foutz would join them about 1899-1900. Their youngest children, John, Charles and Vance (Colt’s great-grandfather), all born within 5-10 years of Oscar and sister Grace, likely were more playmates in the new and strange city than proper uncles. In 1902, Sherman accepted leadership of the Knights of the Maccabees of eastern Pennsylvania. The family moved to Reading, Pa., where Sherman set about growing the membership from just over 90 to more than 3,500 over the subsequent decade, and grew his fire insurance business as well. Far from the farming life in eastern Ohio, Oscar and sister Grace enjoyed the privileges of a well-known, well-to-do family. In October 1906, the Reading Times spotlighted 17-year-old Oscar Foutz for his role in alerting firemen to a blaze that broke out after 10 p.m. in a tailor’s business at 15 N. Sixth Street, just a few addresses down from father Sherman Foutz’s fire insurance business at 40 N. Sixth. By 1909, 20-year-old Oscar is employed as a clerk, according to the Reading city directory. The family moves to Harrisburg that year, and according to the census, Oscar finds work there as a fireman for the railroad. In contrast to Grace’s intellectual pursuits, Oscar Foutz attracts newspaper ink for various sporting exploits, and his active role in the Pennsylvania National Guard. An April 1909 article in the Reading Times reports Oscar’s second-prize finish in a pool contest at Penn Parlors. An August 1910 piece in the Reading Eagle tells of a “a lively and amusing” boxing match between Oscar and another National Guard private to settle a “small dispute.” Oscar won. 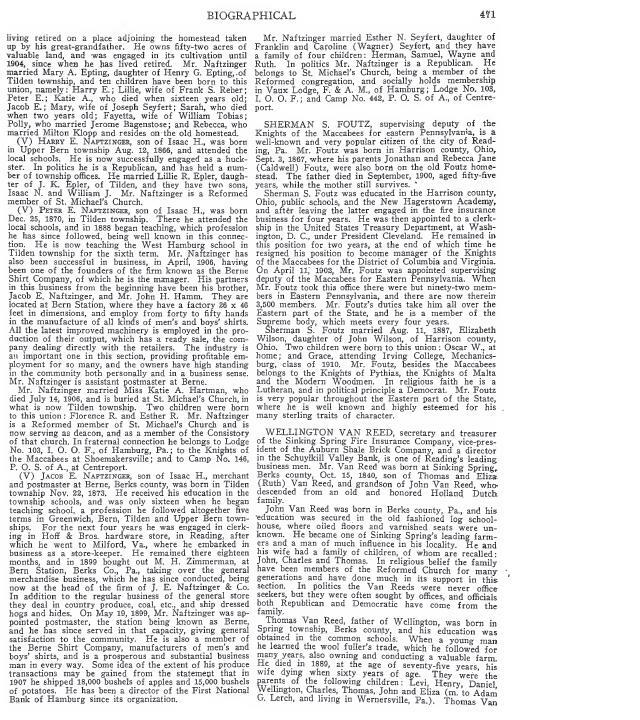 In Harrisburg, an October 1911 Telegraph item lists Oscar among the members of the Hassler Athletic Club baseball team, which promised to have a stronger squad the next season. It’s important to note that these are all the exploits of a newly-married man. Before the Foutzes leave Reading, Oscar marries Florence Hartman. There may be nothing curious about the timing of their marriage license application, filed Jan. 1 1908 in Berks County. But by the time the two are married nearly 10 months later, Florence is far-along pregnant with their first son, Ralph. The wedding is reported in the Sept. 29, 1908 edition of the Reading Times. 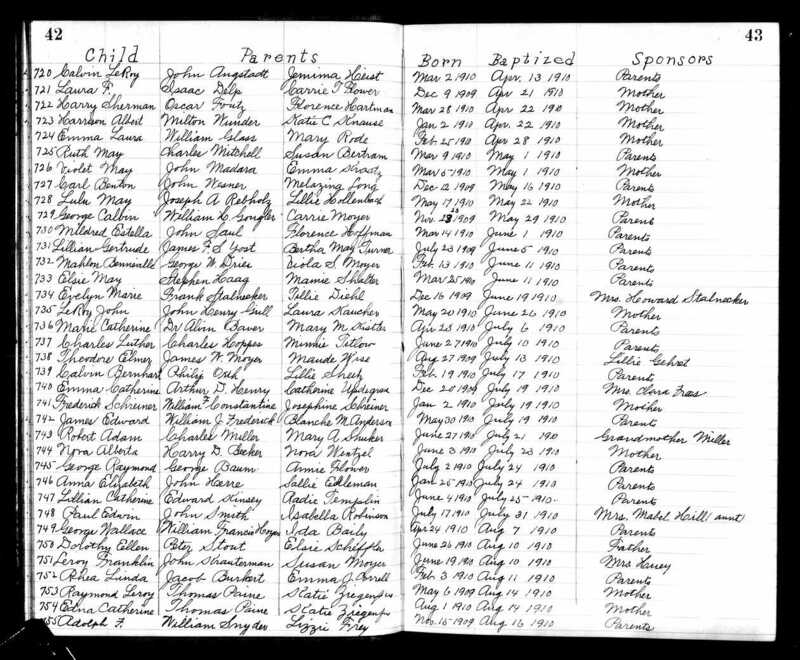 Son Ralph’s birth less than three months later, on Dec. 19, 1908, is recorded by Alsace Lutheran Church. Oscar’s troubles seem to begin not long after second son, Harry Sherman, is born March 28, 1910. The young family appears to live a divided existence. 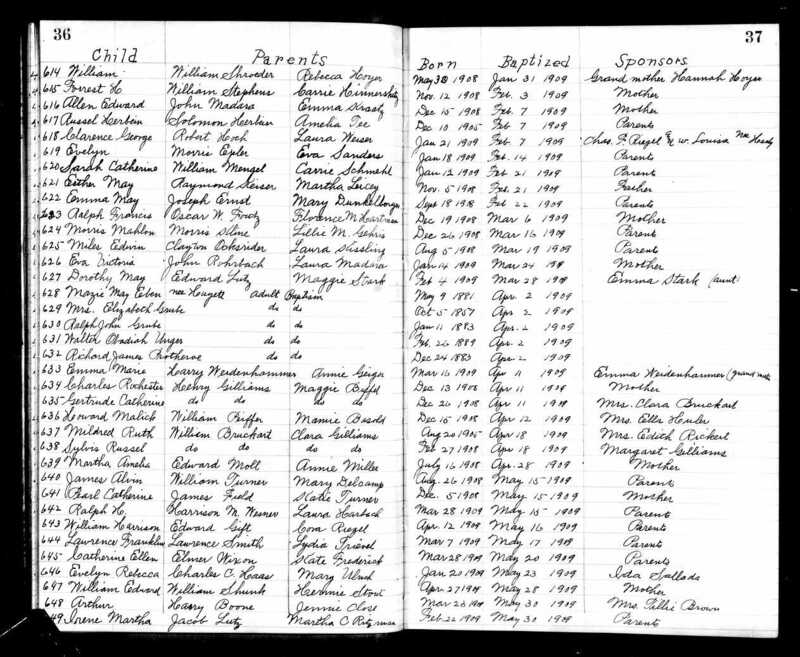 The 1910 census, taken that April in Harrisburg, finds Oscar, listed as married 2 years, and eldest son Ralph in the home of Sherman and Elizabeth. Meanwhile, 60 miles to the east in Reading, Florence appears in the household of parents Francis and Kate, along with brother Lloyd and sister Hannah. She is listed as single. There is no trace of brand new infant Harry Sherman, though the census taker visited on April 21. The names of Florence’s parents — and their address — match their wedding announcement of two years prior. And match names listed in Florence’s death announcement (many years later, which we’ll get to). So this is undoubtedly the family. Maybe there’s some fudging going on. Or three-weeks-old Harry Sherman is still in the hospital (though he’s scheduled for his christening the next day). Curiously, a family of Wunders — Florence’s mother’s maiden name — boards with the Hartmans, and another Wunder family lives next door. In Milton’s house, the youngest child is named Harry (though listed as 4 months old — could they mean weeks?). In Daniel’s, the youngest is named Ralph, age 3 (older by one year than Florence’s son Ralph who is reportedly living in Harrisburg with his father’s parents). Both Milton and Daniel match names listed in Florence’s grandfather William Wunder’s 1902 obituary. Not yet definitive evidence that the Hartmans passed off 19-year-old Florence as single and passed on her children to siblings. But interesting. Oscar appears to later gain reinstatement to the National Guard and continue his family life. A July 1911 article in the Reading Eagle reports a Florence Foutz visiting the guard camp at Mt. Gretna. A July 1914 report in the Reading News-Times again lists Oscar as getting ready for that year’s camp at Mt. Gretna. But by father Sherman Foutz’s death in April 1915, Oscar, not listed as a survivor in Sherman’s obituary, but included in the death announcement, reportedly lives in Arizona. Perhaps Oscar is there with the Guard? Census records and numerous newspaper articles indicate the absence of Oscar from the lives of sons Ralph and Harry. More on them in the next installment. Meanwhile, mother Florence Hartman remarries, to a William F. Orner. Has another child, Raymond Carroll Orner, born Feb. 17, 1918 and baptized where her older sons were, Alsace Lutheran Church in Reading. The record gets murky from here. The 1920 census shows, curiously, a Florence M. and Frank Orner living in Harrisburg, Dauphin County. In their household is a nearly two-year-old “Carrol L. Orner” — and also an 8-year-old Sherman (who, if it’s Harry Sherman Foutz, should be 10). We know that Ralph is listed in grandmother Lizzie Foutz’s household, so this may explain the whereabouts of both brothers (if not father Oscar). The 1930 census lists a married Florence M. Orner, age 39 (the right age), living in Dauphin County and in the company of a 68-year-old Adaline Orner, albeit in the Pennsylvania State Lunatic Hospital. Hmmmmmm…. Florence’s obituary appears in the March 12, 1938 edition of the Reading Times, spelled “Oner.” Sherman, Ralph and Carrol are all listed as survivors, as well as “Catherine,” wife of Roy Rutt. Now, I have not found the origins of the adopted Catherine Foutz, later Mrs. John Roy Rutt, but I have also not detected Catherine in the home of Francis and Katie (Wunder) Hartman prior to her living with Elizabeth Foutz in 1920. So I think this is just a nod from Florence to her former sister-in-law. But… I’ll keep following the trail. Florence is buried in the same Epler’s Church Cemetery as her parents and several siblings. Incidentally, she dies at the same age as Oscar’s father.